Are you trying to engage your inactive subscribers? 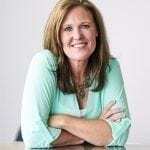 Are you unsure what a successful reengagement campaign strategy looks like? Here are some insights and key takeaways from Return Path’s recent study, Email Win-Back Programs: Everyone Recommends Them, But Do They Work? 1. 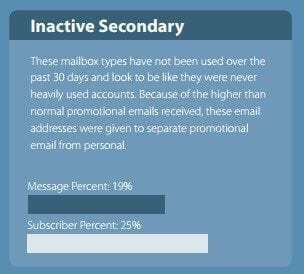 Over 25% of email addresses in the databases of the companies that were part of the study were classified as “inactive.” Inactive mailboxes are email accounts that haven’t been used in 30 days or more. Key Takeaway: It’s not uncommon for brands to have many subscribers in their email database that aren’t engaging with their email program – or any emails at all! Marketers need to work to not simply grow their email database, but promote the value of receiving email from the brand so subscribers want to give you their active email address during the sign-up process. 2. The overall read rate for these marketers is 14%. The read rate for the win-back campaigns sent by these marketers is 12%. Key Takeaway: There are many factors that come into play with the expected response rate for your win-back campaigns. These include the source of the email address, how long they have been inactive with your brand, and your brand’s traditional buying cycle. But, more than likely, these inactive subscribers will have a lower response rate (sometimes much lower) than your average campaign metrics. For example, re-permission campaigns (emails that attempt to get long inactive recipients to opt-in to receiving email again) had a dismal 1.8% read rate. Don’t let that stop you – it’s better to have subscribers on your list that want your email. 3. Just because a subscriber doesn’t read your win-back campaign, doesn’t mean that they won’t read future messages. Our study found that even though subscribers may not have read a brand’s win-back campaign, 45% of subscribers read subsequent messages. Key Takeaway: Email inboxes are busier than ever. Sending one campaign to try and woo your subscribers into action isn’t enough. We recommend sending a series of emails (with a variety of subject lines and potentially a variety of tactics) over a couple of weeks to try and kindle the spark. 4. The average length of time between when people received a win-back email and when they read a subsequent message was almost 2 months (57 days). 75% of subscribers clicked on a subsequent message within 89 days. Key Takeaway: Don’t immediately remove people that don’t respond to your win-back campaigns. You may be removing subscribers who regularly engage with your brand in another channel or are just not in the buying cycle. Be sure to carefully monitor engagement metrics for inactive subscribers (complaints, increases in unknown users, etc.) to ensure these inactive names in your database aren’t hurting your email program. 5. 4 percent of subscribers who received win-back emails stopped getting future emails. However, 85 percent of the 4 percent had read the win-back message. Key Takeaway: Opens and clicks are only part of the email engagement equation. Subscribers may be reading your email, but you don’t have visibility into this. It is important to look at all activity for an email address (reads, purchases, etc.) and not remove subscribers immediately after a reengagement campaign. (Tip: Check out Return Path’s Inbox Insight product to learn how you can gain visibility into additional engagement metrics). 6. 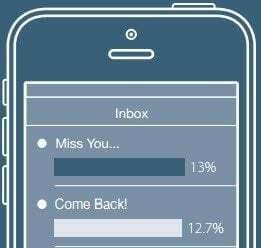 There was no real difference in read rates for the most popular subject lines phrases associated with reengagement campaigns: “Miss You” (13%) and “Come Back” (12.7%). In addition, hen we looked at the sentiment of the subject line (straight-forward vs. emotional), there was no difference in read rate between the two approaches. Key Takeaway: There is no “silver bullet” subject line. Marketers need to test a variety of keywords and approaches to determine what works best for their audience. What we do know is that your subject lines need to differ from your standard subject line enough to pique a subscriber’s interest. 7. $ off discounts in the subject line were nearly twice as successful at getting people to read the email than emails with % off discounts. Yet, most marketers use % off in their win-back email subject lines. Key Takeaway: Like above, testing is the key to determining what works best for your specific audience. Analyze past campaigns to determine what types of incentives have worked for your email program. Marketers need to test different offers, excluding an offer in the subject line, and excluding an offer all together to see what drives these inactive subscribers. Want more details? Download our win-back study or view successful win-back creative examples in our on-demand winback webinar. Or contact Return Path to understand how our Professional Services team can help craft a successful reengagement strategy.